Verifone Systems, Inc. (NYSE: PAY) and P97 Networks, Inc. announced that P97’s PetroZone® Mobile Commerce and Digital Marketing Platform has been certified to integrate with Verifone’s cloud-based POS and site management software solutions—providing gas stations and convenience stores a combined, fully integrated solution for mobile payment acceptance in-store and at the pump. P97’s PetroZone solution provides merchants with a 360° mobile marketing and commerce platform that supports mobile payments, digital offers and customer rewards as well as integration with loyalty hosts. With P97’s mobile payment processing application (MPPA), which is based on the Conexxus Mobile standard, gas stations and convenience stores can support “branded” mobile apps that enable consumers to take advantage of loyalty programs, discounts, and frequent shopper reward programs. P97’s mobile payment applications provide consumers with an easy and fast onboarding process, including the registration of payment credentials and loyalty cards through an isolated and secure channel connected to their mobile wallet, also called a “token vault.” Integrating this tokenized mobile commerce platform with Verifone’s solutions enables P97 to provide the highest level of security and PCI compliance. The fastest site controller in the petro space, Commander Site Controller is Verifone’s single site management software platform that supports all petroleum and card brands, providing increased speed in at-the-pump and in-store payment acceptance, fueling operations and back office control. Its cloud-based software management system—Commander Console—allows managers and owners to manage all aspects of their business, including payment, in-store and forecourt operations. RubyCi combines Commander Site Controller with Ruby2, Verifone’s latest POS workstation featuring a touch-screen console and multicore processor for fast, efficient order taking and payment processing—all through a centralized device that increases counter space for each work station. 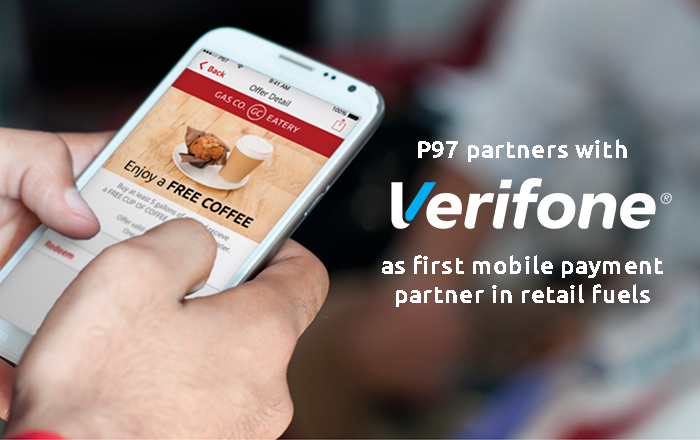 “P97’s certification with Verifone is a perfect example of Conexxus members collaborating together to develop and deliver new mobile payment innovation based on industry standards for their customers,” said Grey Taylor, Executive Director of Conexxus. “Both of these companies have embraced the value of industry standards and have worked closely with Conexxus to ensure the Mobile Payments standard enables mobile commerce solutions that are easy to deploy. PetroZone®, created by P97 Networks, is a cloud based mobile commerce platform which connects consumers with retail fueling merchants and convenience stores across a broad partner ecosystem, including oil company payment networks, merchants, consumer packaged goods companies, automotive companies and banks. Consumers using their PetroZone enabled mobile phones and “connected cars” have better mobile shopping experiences, options for lower fuel prices and opt-in personalized digital offers for in-store purchases. PetroZone ecosystem partners can gain consumer loyalty through omni-channel marketing opportunities and “connected-consumer” experiences when enabling mobile payments and settlement, behavioral marketing and digital offers, and hosted-managed point-of-sale solutions when connected to PetroZone’s open integration framework. P97 Networks provides secure cloud based mobile commerce and behavioral marketing solutions for the convenience retail and fuels marketing industry under the brand name PetroZone®. P97’s mCommerce solutions enhance the ability of convenience store operators, marketers, and oil companies to attract and retain customers by providing technology that securely connects millions of individual mobile phones and connected cars with identity and geo-location based software technology to create truly unique connected-consumer experiences. P97’s software personalizes the “find-buy-save” experience for every mobile consumer. For more information visit www.p97.com or follow us on Twitter @P97Networks.